This Belgian aristocrat is best known as an endurance race winner, often paired with Phil Hill in Ferraris. He and Hill won at LeMans in 1958 and 1961 in 3-liter V12 Ferrari Testa Rossas, and again in 1962 in a special 4-liter Ferrari. In addition Gendebien won the 24 hour race in 1960 partnered with fellow Belgian racer-journalist Paul Frere. 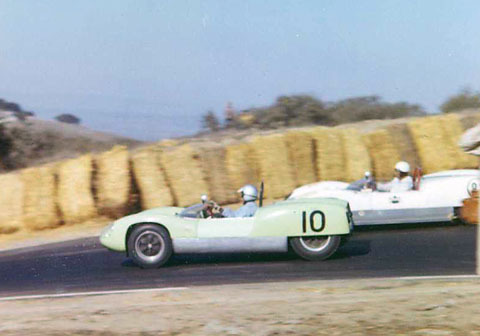 At Laguna Seca on October 21-22, 1961, Gendebien won the "Under 2-liter class in the #10 UDT-Laystall entered 2.0 liter Climax-powered Lotus Mk.19. Gendebien's skills and the ultra-light Lotus were too much for the Porsche Spyders on this day. Gendebein was 8th in the first heat and 9th in the second. Here Gendebien passes Canadian Peter Ryan in his 2.5 liter Lotus Mk.19. This particular Lotus sure squats down under power. 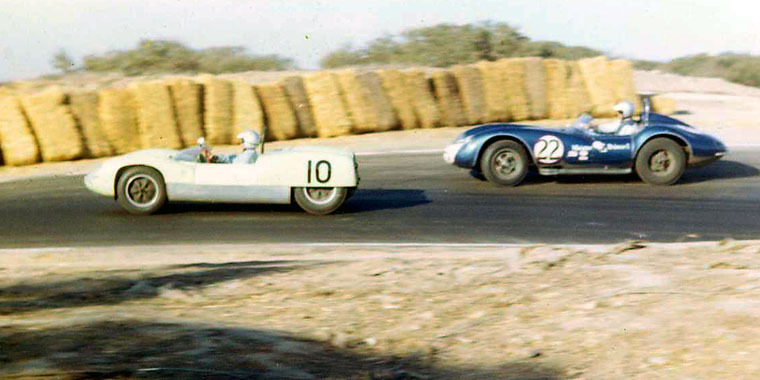 Here Gendebien has just squeezed by Harry Heuer's "Meister Brauser" Scarab in Turn 5. Now he floors it as he sets up to power down the corkscrew. Heuer, off-line and out of shape, struggles to control the sliding Scarab.